It is difficult to view a sumptuously decorated medieval manuscript without being amazed by the high level of craftsmanship. The creation of an illuminated prayer book, such as the celebrated, Les Tres Riches Heures du Duc de Berry, would have involved many skilled artists and artisans such as a scribe or scribes, a supplier of vellum, a book binder as well as those to design and tool the cover, which often was leather and sometimes encrusted with gems. In addition, there probably were letter illuminators, who embellished the large capital letters, page decorators, who worked on the drolleries and borders surrounding the text, and painters, who created larger illustrations to complement the content of a page. Each of these specialists blended their artistry toward the common goal of creating a single prayer book. The same approach to “reading” the details holds true within modern craft. Without seeing an autograph, wall caption or label, small things such as surface ornament, the shape of a base, or a specific use of color can serve as visual pointers to an artist’s identity. Five teapots by Rebecca Zimmerman offer a wonderful example of how such elements can help to define a signature style. Though distinct in appearance, each of these teapots shares a number of common traits. Overall, Rebecca’s designs reveal a delight in vivid color and a quirky interpretation of natural forms. 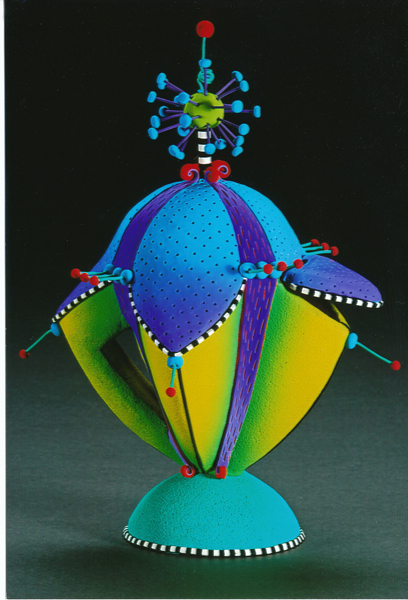 Her vessels are playful and lively. These characteristics are fairly general however, and might be applied to many other artists’ creations. So what exactly helps to define Rebecca as the sole hand behind this body of work? 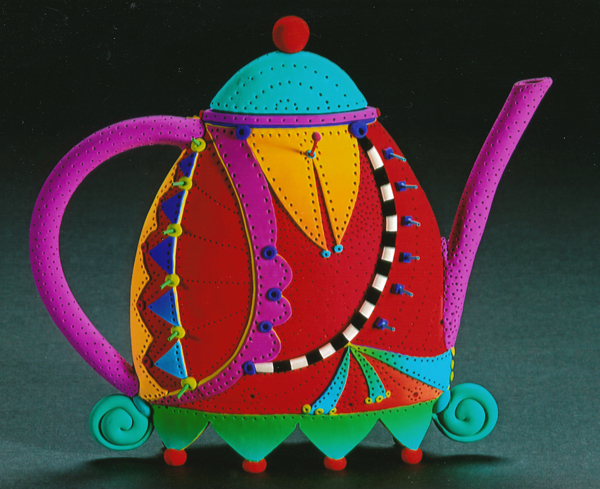 Obviously, each of Rebecca’s teapots is very colorful. Her palette consists of strong, saturated color. Although there are areas of graduated blends in each piece, the predominate impression is one of blocks of a single, bold color set next to another area of contrasting hue. Turquoise appears next to red, or fuchsia abuts a field of yellow. The overall form or shape of these teapots is also similar, but certainly not identical. While far from natural looking, her forms seem to be inspired by the organic curves and pods of the natural world- although maybe not of our planet. There is much whimsy in her amalgamation of curves and irregular shapes. An extended straight line or right angle is rare, but rhythmic waves and curves are omnipresent in these imaginative vessels. 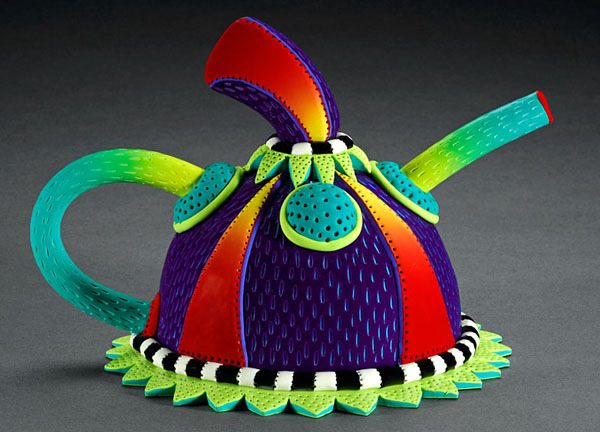 All of the teapots also exhibit a highly decorated surface. Rebecca uses texture and bits of simple patterning to add ornamentation. 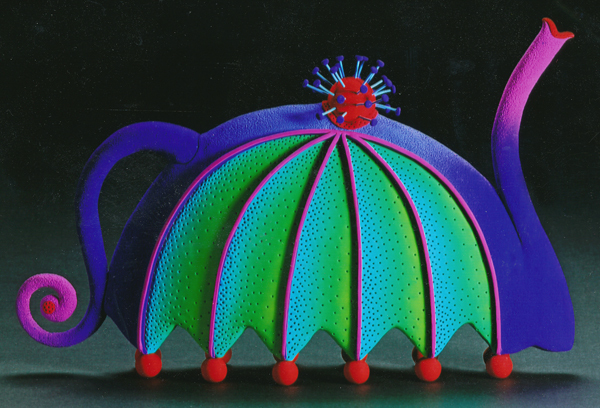 Note the recurrence of similar decorative elements within a single teapot. These same motifs, such as patterns of simple pin prick holes or a field of short slash marks appear repeatedly in other teapots. Each of the teapots also includes some kind of a zigzag type embellishment, either though applied clay or the sometimes angled and sometimes softer delineation of the bottom edge. Only this teapot above varies the application. With its single pedestal type base the entire structure of this teapot is a three dimensional zigzag form. 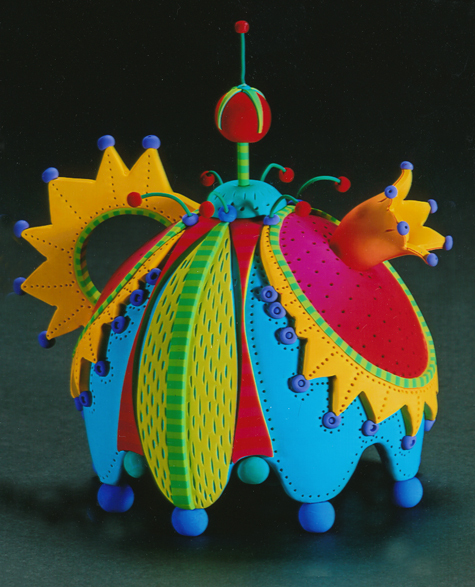 Other continual decorative themes are coils, balls, small applied dots and the use of a filament extension- sometimes straight and sometimes curved- with a ball of clay at one or the other end. The repeated use of a ball “foot” to elevate the teapot off its irregularly edged bottom is yet another detail that echoes the use of the sphere. Again, this teapot lacks ball feet, but its large domed base is itself a half round. One last, perhaps more subtle, characteristic of Rebecca’s teapots is the finish of her surfaces. The applied details, carved texture, pin pricks and slashes all create textural interest, but her surfaces all remain quite matt. The effect is reminiscent of boldly appliquéd felted fabric and further enhances the playful quality so prominent in these vessels. Although there is nothing particularly unique about any one of Rebecca’s many design features, collectively these individual elements comprise a distinctive set of traits that help to define her work. Once familiar with Rebecca’s repertoire of motifs, the discovery of a similar looking, unlabeled teapot in the window of a gallery would pose little challenge of artistic identification. There are many methods to approach issues of visual recognition, but the details that enhance the whole often offer the best clues of identity, and thereby become an artist’s unconscious signature. *Les Tres Riches Heures is one of those manuscripts where at least some of those involved have been identified. The large full page illuminations are believed to be by the three Limbourg Brothers. A note of thanks to D. Kinder of Illinois who provided images of these pieces from his collection.